Gary Stockel, who was hired in 2014 to replace Vicki Helmar. In addition to his duties as Agricultural Commissioner, Stockel is Sealer of Weights and Measures, Air Pollution Control Officer, and Animal Control Director. He was born and raised in Hayward. He graduated from UC Berkeley in 1980 with a degree in forestry. He worked seasonally for the U.S. Forest Service in Idaho and in the Stanislaus National Forest (which straddles Tuolumne and three neighboring counties). He later joined the Alameda County Agricultural Commissioner’s Office as a trainee. “I had no clue what an ag commissioner was at the time,” he said, adding he’d heard about the job from an Alameda CAC senior agricultural biologist, Eric Lauritzen (later Monterey County’s long-time ag commissioner and, now, DPR special advisor). 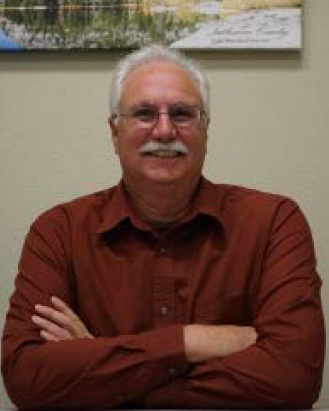 Stockel stayed on with Alameda from 1982 to 1990, and then took a job with San Joaquin County as a senior ag biologist, and in 1995 promoted to deputy ag commissioner in charge of the pesticide use enforcement program. He was later promoted to assistant ag commissioner in 2008 and stayed there until 2014. An avid backpacker, he enjoys the area’s outdoor recreational opportunities and Gold Rush history. His ancestors settled in the county in the mid-1850s after immigrating to the U.S. from Hanover, Germany. There’s a monument to the Crimea House – a ranch/roadhouse/freight/stagecoach stop run by his early relatives – near Chinese Camp, a ghost town on the way to Yosemite National Park. While hiking the high country, he also found an 1875-built cabin once operated from 1900-09 by his relatives while summer grazing their cattle that has remained in continuous use to this day as a modern-day Forest Service grazing allotment at Cooper Meadow. 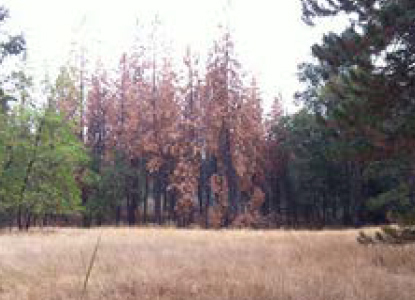 One of the biggest issues confronting Tuolumne County is tree mortality – the result of drought and bark beetle infestations (Most of the county is forested, containing the bulk of Yosemite National Park and the Stanislaus National Forest.). However, the commissioner has also focused on education about well head protection – an issue when herbicides are applied near water wells – and DPR’s new school regulation. While not a heavily farmed county, 7 to 10 growers are affected by the regulation – which limits agricultural pesticide application times within ¼ mile of a school site and requires schools be notified annually of planned applications. “We are working one-on-one with them,” Stockel explained. The department recently produced a guide for wellhead protection – important in a county where many people and small water agencies draw drinking water from wells. The department has also done more outreach work with pest control professionals.